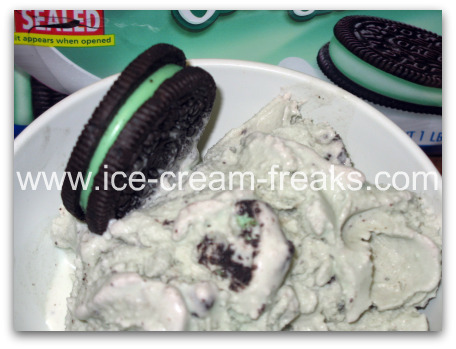 This fantastic mint cookies and cream ice cream was made with the following recipe. In this recipe we used mint oreos. And to get the right mint flavor, we used Torani's creme de menthe syrup . (Ohh so good!) If you like mint oreo blizzards at Dairy Queen, you'll love this homemade ice cream. The only change I would make to this recipe would be to add some green food coloring. The syrup is green and gives the ice cream a nice color until the cookie pieces are mixed in, then it becomes a bit cloudy and dull. 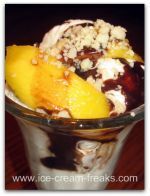 As you can see from my picture, I didn't let the ice cream harden in the freezer before serving it either. I usually prefer to scoop it, but I couldn't wait and it wanted to be eaten. So, I eagerly obliged. Use a 2 Qt. 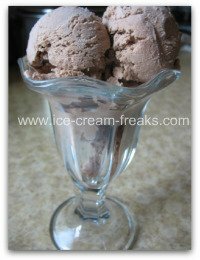 ice cream maker or cut the recipe in half for smaller ones. *Add 6 or more drops of green food coloring to keep the ice cream green. Mix all ingredients in a bowl. Make sure sugar dissolves. Pour it into your ice cream maker and freeze according to the instructions it came with. This will take about 25 minutes. Add the cookie pieces during the last 5 minutes. 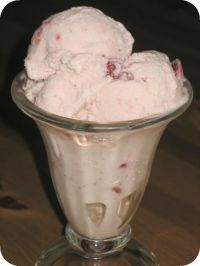 Transfer ice cream to containers and freeze until firm, or eat it right away if you like it soft. To make mint brownie ice cream, omit cookie pieces and add frozen brownie chunks not much bigger than a chocolate chip. For a grasshopper pie, take a store bought oreo pie crust and fill it with a layer of hot fudge sauce, then softened mint oreo ice cream. Freeze for a couple of hours. Top with some whipped cream and some mint oreos. Make a mint oreo milkshake by putting 1/2 cup milk and 3-4 scoops of the mint oreo ice cream into a blender.